Fosjoas offers several different types of electric scooters, such as K1 motorized skateboard, K2 scooter, K3 sitting-posture scooter, U1 mini scooter, U3 SUV scooter, V2 twin-wheeled scooter, V6 electric one wheel unicycle, V9 two-wheeled electric scooter and so on. V9 is the focus today. Comparatively speaking, it is more suitable to be used as a transport for weekend travel. The following explain why. Strong driving force is the cornerstone of all travels and it is the highlight of Fosjoas V9 two-wheeled self-balancing scooter. It is powered by 520Wh Japan-made lithium-ion battery, which is rechargeable for 3000-4000 times and whose lifespan is 3.8 times longer than that of ordinary lead batteries. More importantly, the equipped SONY lithium-ion battery is non-flammable, non-explosive and high-safety. According to the test, the fully-charged battery is able to sustain as long as 45km, which is enough for a short journey on weekends. Comfortable riding experience also plays a key role in weekend journey. 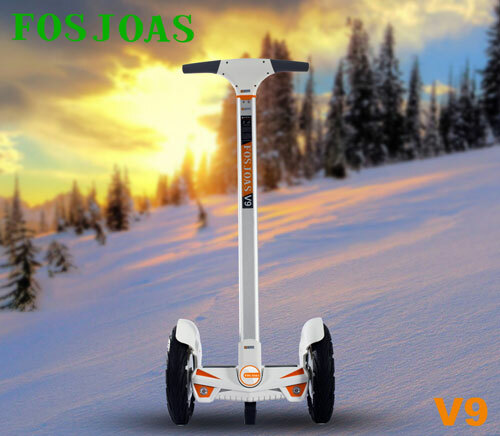 Like others, Fosjoas V9 electric scooter is based on aerospace attitude control theory, fuzzy software algorithm and gyroscope system to keep itself balanced automatically, which makes riding more easily. All controls, including advancing, accelerating, decelerating, braking and steering, can be realized by regulating body gravity. Take advancing for example. If riders lean body forward slightly, Fosjoas V9 scooter will move forth automatically. Playing music adds more pleasures into journey. Fosjoas V9 two wheel electric scooter is equipped with closed stereo that offers high-quality music. At the same time, the closed stereo can be connected with the phone and plays the nice songs in it. Then, the trip won't be tedious any more. In addition, it also has a 4-inch LED displayer that can clearly show the real-time data, like current speed, outdoor temperature, remaining battery and total mileage, which lets riders know the state of Fosjoas V9 scooter much better. Above all, it offers an enthusiastic weekend travel.